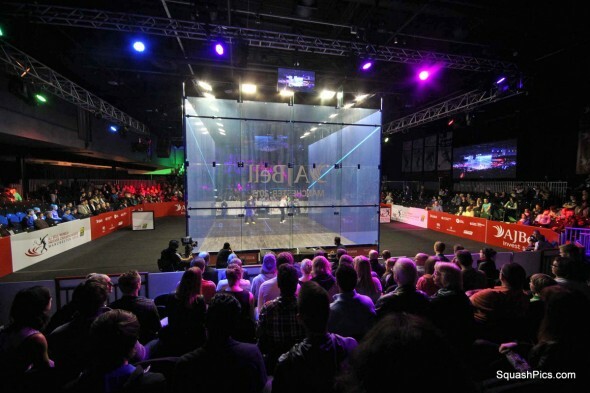 Sixth-seeded Egyptian Mohamed Elshorbagy upset England’s No3 seed James Willstrop in the quarter-finals of the AJ Bell PSA World Squash Championship at Manchester Central in Manchester to set up a semi-final clash with France’s No2 seed Gregory Gaultier. 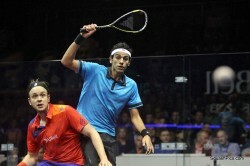 Elshorbagy, the world No6 from Alexandria, was meeting England’s James Willstrop in a repeat of last year’s semi-final which went the full distance – with the Egyptian underdog prevailing in 112 minutes to reach the final as the No8 seed. Since then, world No3 Willstrop has claimed two Tour wins over Elshorbagy – and boasts a 9-2 career head-to-head over the 22-year-old. But Elshorbagy was in dominant form – winning the first game after a run of five points in a row from 2-3, and again jumping from 2-3 down in the second to go 8-4 up before forging a 2/0 lead. But after Elshorbagy took the opening point of the third following a Willstrop error, the third-seeded Englishman crafted nine winners in succession to claw back the deficit. At four-all in the fourth, Elshorbagy took a brief timeout for a ‘blood injury’ – and it was neck-and-neck thereafter, with Willstrop leading 9-7. 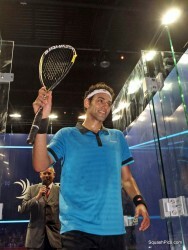 “At 9-7 down in the fourth, I just went for it – he was playing more accurately than me at the time,” explained Elshorbagy later, describing the sensational four points in a row he won to clinch the match 12-10, 11-6, 2-11, 11-9. “I had to hit the ball hard. I knew I had to win the game – I didn’t want to go into a fifth. “The first game was crucial – and winning it gave me huge confidence for the whole match. I knew he’d start the second well – and I wanted to get a big lead. I thought I did that well. “I felt I was playing his game better than him – then I started to play the game I wanted. It was a demoralised Willstrop who tried to explain the outcome later: “I lost context, I lost perspective. I don’t like losing. “I was very poor at 9-7 – I thought the rest of the game was fine – but to do that at 9-7, two errors on the trot – you just can’t do that at this level. If those errors hadn’t happened – who knows? “I felt happy as I walked onto the court – I was in a great frame of mind. It was a great atmosphere and a fantastic crowd. 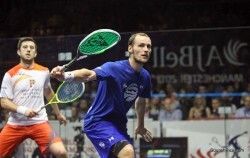 Later Gaultier became the only player to reach the semi-finals without dropping a game when he beat surprise English opponent Daryl Selby. The 13th seed from Essex reached the quarter-finals for the first time after upsetting Egypt’s No5 seed Karim Darwish, a former runner-up, in the previous round. World No2 Gaultier is enjoying the best form of his life, with final appearances in his last three Tour events. The 30-year-old from Aix-en-Provence raced to a 7-2 lead in the opening game before Selby, ranked nine places lower, took three points in a row – but was unable to stop the Frenchman establishing a 1/0 lead. The second followed a similar pattern – but this time Selby was only able to win four points before Gaultier moved 2/0 up. Spurred on by the near capacity and partisan crowd, Selby found his form in the third, establishing leads of 4-0, 5-2, 6-4 and 8-6 before reaching game ball at 10-9. But, true to form, Gaultier found extra reserves to win the next three points to claim an 11-7, 11-4, 12-10 victory after 60 minutes. 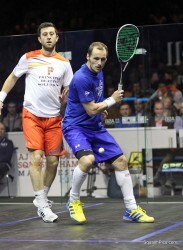 Gaultier later admitted: “I started really well in the match, was really focussed and for two games I was really on fire. Selby agreed that his opponent is in the form of his life: “He played a spectacular game against Nick (Matthew) in the final of the US Open last month. “But I really wish I’d won that third game.